This month’s kit is Magic Potions! 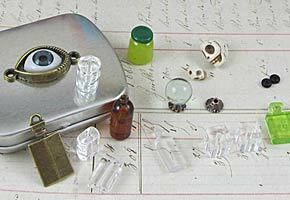 And it should be subtitled “a study in size contrasts” because in addition to this teeny, tiny kit, there is another kit with a larger, chipboard book with a hidden drawer (Secret Spell Book Box Kit). 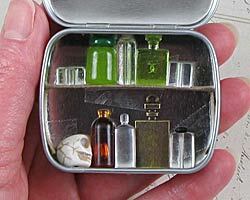 Starting with the tin in this kit: the Small Hinged Tins are smaller than the Altoids Tins. This one is 2-1/2" x 2" x 1/2" tall. And I made a Covers for Apothecary Tins Collage Sheet with covers to fit this new small size tin (and the Altoids Tins) with lots of fortune teller image options (and a couple options for making your tin look like an old magic book or a vintage card deck box). The collage sheet is also included in the kit. I had such fun finding tiny little bottles to fit inside (even in 2 rows... see my photo below with me holding the tin). Also a tiny marble (and a little bead cap to sit it on) to make a crystal ball. 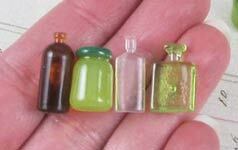 And with these small sizes, the bottles and "crystal ball" are perfect for 1:12 scale dollhouses! 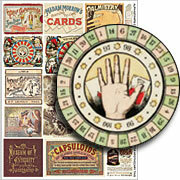 Not standard tarot cards but 19th century French fortune cards. Card are in 3 sizes; the largest are 1-3/4" tall (still small). Note: the tiniest cards are approx 1/2" tall and can be used for 1:12 scale dollhouse miniatures. Beside the teeny tiny bottles in the Magic Potions Kit, this sheet has labels sized to fit bottles from the Even Tinier Bottles, up to the 2 Inch Glass Bottles (and lots of things in between, including the set of Corked Vials, Mini Inkwell Bottles, 12 Tiny Glass Bottles, 3cm Tall Bottle with Cork and 1-1/2 Inch Glass Bottles). See the "We Also Recommend" section below for photos/links to most of the items in the kit — the ones that are available to purchase separately. Note: the site will only allow 9 items to be shown below, so do check this custom search to see photos of all of them. 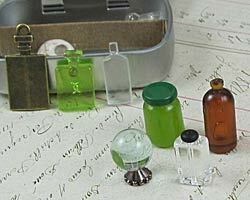 AND: all the bottles, charms and embellishments in the kit are On Sale, too! 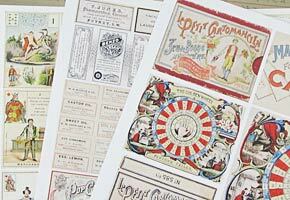 See the newsletter announcing this kit for artwork by Design Team Member Kristin Batsel and new related supplies! Love Potion #9 by Design Team Member Kristin Batsel. See the Supply List. Odessa Grim's Spell Book byCaroline Ouzts-Hay. See the Supply List.